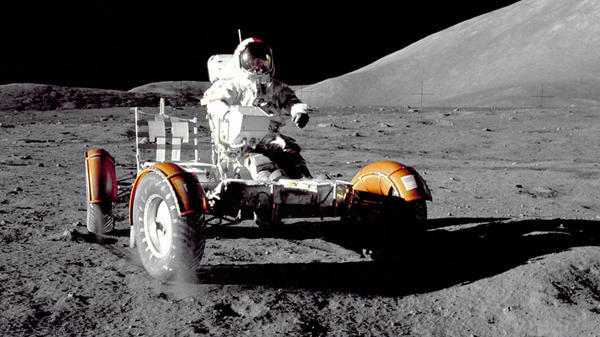 Apollo 17 commander Eugene A. Cernan takes a Lunar Roving Vehicle for a spin at the Taurus-Littrow landing site during the 1972 mission. 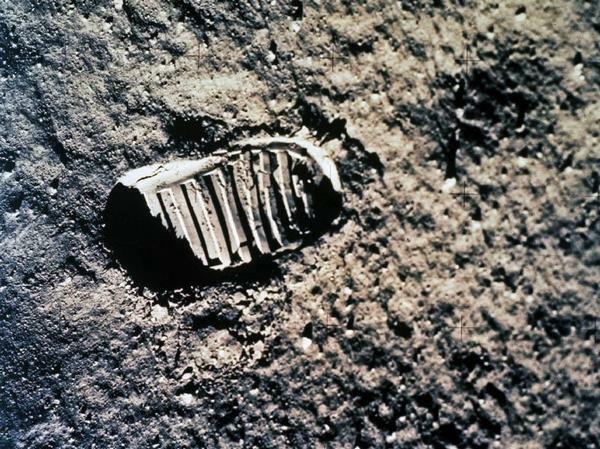 On July 20, 1969, the world watched Neil Armstrong take humankind's first steps on the moon. It wasn't that long ago the United States owned the moon, or at least it seemed that way. 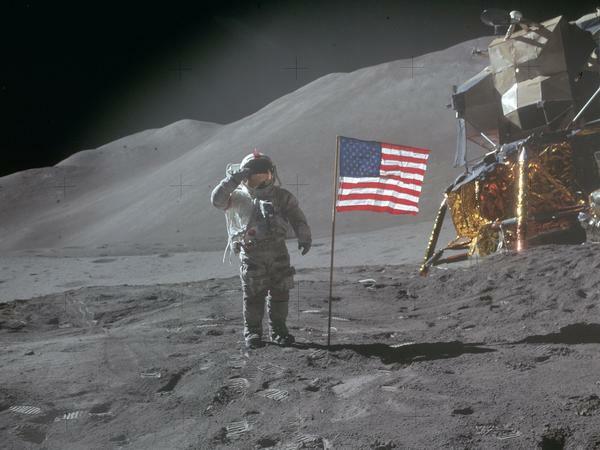 American astronauts on six different voyages between 1969 and 1972 planted U.S. flags on the breezeless lunar surface. They also left behind plenty of artifacts of historical and scientific import: equipment from numerous experiments, three "moon buggies" and of course Neil Armstrong's iconic first boot prints. It's all there, untouched, like dioramas in some otherworldly museum. But this could change. The world's attention may be riveted to Mars, but other nations and private space ventures are aiming to potentially leave their own prints in the moon's powdery soil. China recently announced an audacious plan to become only the third nation — and the first in nearly 40 years — to land a probe softly on the lunar surface. That's prompted some nervousness about keeping Armstrong's "one small step," and everything else left behind by Apollo astronauts, safe and secure. The Google Lunar X Prize, a contest offering $30 million to encourage the development of the first privately funded moon rover, agreed earlier this year to abide by NASA guidelines to protect the Apollo landing sites. "They are something precious. They represent the first time that humans set foot on another world," says Andrew Chaikin, who has written a number of books on the history of space exploration. Roger Launius, senior curator at the National Air and Space Museum in Washington, D.C., says the Apollo sites must be protected — along with the 1960s Surveyor moon probes that paved the way for manned exploration, and several Soviet-era probes, including the first Curiosity-like rovers. Using a museum metaphor, Launius says they should be safeguarded with the equivalent of "ropes and stanchions." His biggest worry: the possible impact of commercial moon ventures. "There are a lot of folks who say they want to go and land something within photography distance of Apollo 11, for instance," he says. "My concern is that they don't disturb the landing site." Images of the Apollo sites taken from lunar orbit in recent years show incredible detail that may have sparked renewed interest in preservation. NASA recently said its analysis of some of those images shows the U.S. flags are still right where they were planted decades ago — all except at the Apollo 11 site, confirming a report by astronaut Buzz Aldrin that the flag had been knocked down by the lunar module's ascent engine exhaust. And there's good reason to think these landing sites could look attractive to future moon missions. The Apollo and Surveyor sites were not chosen arbitrarily, Launius says. They're all concentrated along the moon's equator on the side facing Earth. The rockier polar regions, which presented more treacherous landings and had less sunlight to power a craft's solar cells, were shunned. Future explorers, he adds, will likely follow the same criteria. Launius points to what happened in Antarctica as a cautionary tale. Historic artifacts left behind on the frozen continent by British explorer Robert Falcon Scott's ill-fated 1910 expedition have since been plundered and vandalized. "People have grabbed souvenirs and carved their initials into the hut — the sort of things that happen all the time — but we don't want to see that repeated on the moon," Launius says. Glenn Harlan Reynolds, a professor at the University of Tennessee, Knoxville, who specializes in space law, says what can and can't be done on the moon is loosely governed by the 1967 Outer Space Treaty, signed by the U.S., the Soviet Union and 26 other nations. "The moon basically has the same legal character as the high seas, where anyone is free to fish or sail their ships," Reynolds says. There is a key difference, however. "In maritime law, you have the concept of salvage, where you abandon something and someone else can take it," he says. "There is no law of salvage for outer space. The outer space treaty says once you own a space object, you own it forever." That means a clause in the treaty prohibiting interference with a country's activities in space should cover American and Russian artifacts on the lunar surface, Reynolds says. Even so, enforcement would be difficult. "The moon is a very big place, and the parts of it that we've been to are very small," he says. Still, Reynolds says he'd be "astounded if the Chinese or the Indians or anyone else would have any interest in doing damage to any of [the lunar sites] anyway." "Now, if the Iranians had a space program," he adds, "it might be a different story."